We aim to improve people’s lives by being Wealthsmiths™ We believe everyone deserves to live their best lives possible. A Wealthsmith™ is a person who has a deep understanding of the true definition of wealth and knows how to create it and maintain it over the long term. To be a Wealthsmith™ is to be patient, to act meticulously and never to be hurried. It’s having a shrewd mind, and an understanding of what it takes to create wealth and be able to give more of it back. Sanlam’s African footprint has shown steady, continuous growth with a proven track record of success. 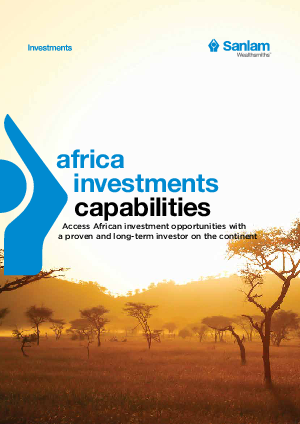 Download this report find out how Sanlam Africa Investments allows clients to capitalise on the attractive long-term returns and diversification benefits of investing in Africa, which Sanlam has experienced as it has expanded across the continent.